Sunday, such severe stomach pains thought I'd end up in hospital. Monday, temp of 103/39. Tuesday, had yet another observation, this time shadowing my assessing skills. I'm going to be an expert soon in what to expect when being observed. Wednesday Joe gets refused a place at college. Thursday Ella's pyscho-therapist shared some sad news with us that is not going on here. Suffice it to say if I ever bumped into her birth parents..... Friday. Joe very upset, quite worrying, can't remember the last time he cried. I got conjunctivitus in both eyes and when chloramphenical drips down the back of your throat it is foul! Took Ella to special needs morning at the UCI - G Force. Think I enjoyed it more than she did. As long as she has something to eat I think we could be watching the test card! Remember the test card?! Ben's guitar lessons started up again. 4 hours spent on my teacher training course. What on earth am I going to do with all the free time come the summer? True, bound to find something else to fill in the time - hopefully fostering! 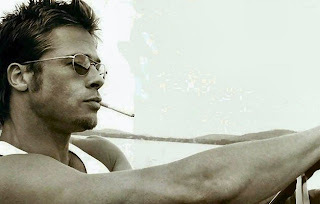 And Brad Pitt as I like him. Sometimes he's just too girly - and at the moment with that dead bird stuck on his chin - don't even go there! oh my oh my oh my!!!! Prayers for a GREAT week this week!!!! !